Woven-Look Striped Blanket Free Crochet Pattern. 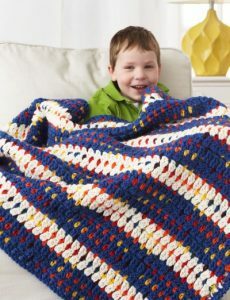 Free Intermediate Child’s Blanket Crochet Pattern. Finished Measurements: Approx 43″ x 54″ [109 x 137 cm]. Fun and engaging project with the look of a woven blanket, featuring a reverse single crochet edging. Crocheted in Bernat Softee Chunky yarn. 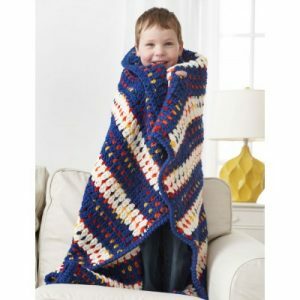 A great free crochet blanket to make for babies and toddlers that can test your crochet skills. For beginner to intermediate crocheters this woven-look striped blanket pattern will keep you interested and enjoying the wonderful and unique fabric, pattern and texture that you are creating. This baby blanket pattern adds an element of interest to the traditional stripes and takes it to a new level!